I’ve decided to limit this article to note and checklist (to-do) applications for the iPhone that are free. I might cover similar non-free productivity apps in a later entry, such as SplashShopper, or Yojimbo if BareBones release an iPhone app. My list below might seem short, considering there are a multitude of to-do list apps. Since I need access to data previously stored on my Treo, I’ve ruled out apps which allow data entry on only the iPhone. The bulk of such apps are like that, with no way to import, at least when I went through the iTunes store in mid-August. The three apps I reviewed depend on web services (i.e., network access via wifi or Edge/3G) to view data on the iPhone. I thought this odd until I realized that until mid-July, third-party apps could be only web apps. (Duh, unless jailbroken.) Because the network dependency, all of these require online registration and login. Evernote: Handles both notes and lists. Desktop app available for Mac and Windows. Jott: Handles notes and lists. Desktop app available for all platforms. Zenbe Lists: Handles only lists. Update (7 Nov 2008): Here’s a good article at Wired on the currently inadequate quality of note-taking apps. Details follow after the jump. Of the three apps I’ve reviewed, I ended up using Evernote v1.2 the most. Everything is a note, though I can add checkboxes to emulate checklists. That takes care of my minimal task requirements. But what makes Evernote so handy is that it’s easy to input and access data, as well as a snap to organize and search through my information. Data are stored on their web servers, as well as the desktop app, should you decide to also use that tool. 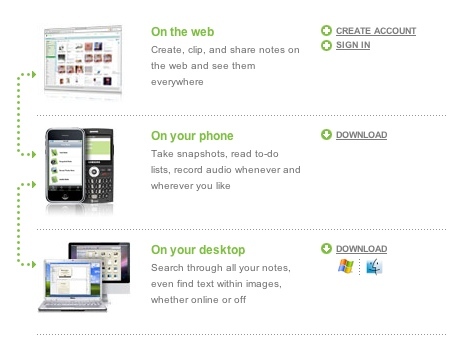 Evernote offers a premium service as a month-to-month or annual subscription, if you need additional server storage. With all the memos and lists I imported (totaling over 60 items), I barely scratched the quotas for the free account. The iPhone app itself is simple and straightforward, with four basic tasks: create a New Note, view and search through Notes, view Pending edits to notes, and Account settings. Moreover, Evernote provides a convenient choice of note possibilites: Text Note (plain or with checkboxes to emulate to-do lists), Snapshot Note (ad hoc camera photos), Saved Photo Note (based on photos already stored on iPhone), and Voice Note (voice recordings up to 5 minutes each, which unlike Jott remain audio and are not transcribed). The Current Search panel (accessed from the Notes view) on the iPhone allows you to search on tags or attributes such as modification time, media content, task completion, and so forth. This is a powerful search tool which doesn’t exist in either Jott or Zenbe Lists. Regarding network access: According to Evernote’s terms, the connection should remain secure, although I’ve seen the https protocol for only the login screen. No offline access for iPhone. That is, no local data storage or access on the iPhone itself. That means that even though Evernote has both a desktop app and iPhone app, you cannot sync the two with each other. (Kind of deceptive considering the prominent image on the left side of their home page, implying that you can sync between the desktop and iPhone.) At present I’d have to sync the desktop data to the web service, then the web service to my iPhone (or vice versa). Evernote becomes useless with poor or nonexistent network access, such as using airplane mode, or traveling within some rural areas. They state that implementing offline support would be difficult, so they plan an interim solution to allow email as a way of accessing one’s notes. But that’s still requires network access, and as I’ve said before, I’d rather not manage notes, lists or tasks in a mail app. 😐 Update: Version 1.4 now allows you to mark individual notes as Favorites, which stores them locally on the iPhone. It’s both a compromising and compromised solution, but at least you can view Favorite notes without a network connection. The iPhone app has a major limitation where it cannot handle editing anything other than plain text. If I used any styles on the web UI or desktop, including font changes or checkboxes, I would not be able to change that content on the iPhone. As a compromise, I can append plain text to such rich content notes. This feels half-hearted, though, since other apps (including Jott, Zenbe Lists, and the myriad iPhone-only-editable to-do list apps) have been able to incorporate editable checkbox or to-do list features. Because of point #2, you cannot mark off checkboxes on the iPhone. True, you can add and remove check marks on the web UI or desktop app. But so much for have a mobile to-do list, hunh? Update: Version 1.3 now allows checkbox marking on the iPhone; they’re working on a way to create checkboxes on the iPhone. Good to see the progress, though! You can create notebooks, which contain individual notes like a folder. In the desktop app, notebooks can be set as either synchronized or local (i.e., not synchronized with the web-based server). But you can set this only once. You cannot change your mind and go between synchronized or local, which is very limiting. Especially since you cannot directly synchronize between the desktop app and the iPhone. Desktop app: Why in the world did they hardcode MS-Windows fonts, rather than recognizing and using Macintosh ones? And unlike the web UI, there’s no choice to change content to plain text. Cannot rename, delete or create Notebooks on the iPhone; can do so only in the desktop app or web UI. Bug: While saving a note on the iPhone, the app switches over to the Pending screen. And stays there after saving completes, which is silly because at that point the Pending screen is empty. It should return to either the Notes screen or the editing screen. Cannot sort notes on iPhone or web UI; those listings are based on last modified and recently created, respectively. Although you can do so in the desktop app. It’d be nice to have landscape keyboard or view. At first I though I needed a quicklist of Notebooks on the iPhone. But then I got into the habit of using Evernote’s powerful tag and attribute based searching UI. Not the same as using folders for categorizing, which would be an added plus, but still quite usable! No transcription for voice notes, but that’s okay. A non-trivial service to build, after all. First off, registration on the website never worked: the form kept rejecting my registration info for a free account. Perhaps it expected a promo code? Instead I was able to register from my iPhone. For the longest time, I could not tell the functional differences between notes and lists. That should be obvious, right? Well, Jott makes the horrid mistake of mixing the note and to-do list UIs on the iPhone. Notes are in a note folder, but wait, to-do lists are individually listed in the the button bar. If I have more than one list, I need to scroll through the button bar. How asinine to combine primary tasks with “file” listings in a small navigational region! But wait again, it turns out that lists can be either part of a note, or standalone items. If it takes more than 15 minutes to figure out the messy hierarchy, it’s not worth my time and effort. Jott Express runs via Adobe AIR, which is included in the download. It’s really more of a web shortcut from your desktop. There’s not even an undo command. Also, when something doesn’t seem to do anything (like the Clean Up button), it makes the app feel half-baked. Why bother when I could use the better web UI from a browser? Voice memos are limited to 15 seconds each. No way to categorize, sort or search through notes or to-do lists on the iPhone or desktop. I can search on the web UI, however. Like Evernote, Jott offers paid services for longer voice memos and additional storage. I am impressed by Jott’s voice transcription feature: its accuracy for writing out what I spoke is very good and very cool. I might use it occasionally for a quick voice memo I’ll later need in text. But for regular daily use, in its current state of too many choices poorly presented, forget it. Zenbe Lists v1.2.1 allows only textual lists, not memos, not pictures, nor audio notes. You have the choice to collaborate (i.e., share lists), although that’s not a feature I currently need. Cannot easily import from a spreadsheet, which is where my many exported checklists reside. I must paste one row at time into a single checklist item, which is way too inefficient and tedious. No desktop tool to access or modify data at all. There are no categories or tags, or folders, as a means of organizing lists. It doesn’t look like they’ll be implementing tags any time soon. There’s no way (AFAICT) to search through lists. Perhaps due to limitations in #3? Zenbe’s login apparently goes over a secure connection, although the URL bar never seems to display the https protocol. Sadly, none of the choices here fill me with an eagerness to jump in and use them fulltime, or at least longterm. Nonetheless, it hasn’t been two months since iPhone 2.0 came out, so I definitely need patience. It’ll be interesting to see what ships over the next several months, whether updates to the ones here, or spankin’ new applications. All likely subject to another entry, of course! This was written by sairuh. Posted on Friday, September 5, 2008, at 5:31 pm. Filed under Library, Software. Tagged iPhone, Macintosh, productivity, review. Bookmark the permalink. Follow comments here with the RSS feed. Comments are closed, but you can leave a trackback. Have you given Noter a try? It’s web based, but it works offline on the iPhone, and it syncs up with it’s online counterpart. It’s fantastic, I would never go back to ever note. or just http://dbelement.com and navigate to the noter app. Hi Emma, I’m not familiar with Noter. Thanks for the tip —I’ll check it out!